Secondly: You mentioned in your book "Khutoot Ra'eesiyyah Li Ba'ath al-Ummah al-Islaamiyyah" (Important Steps to Revive the Islamic Ummah) pp. 72-73 whose text is:" In a general sense, there is no place (role, space) in our Arabic and Islamic nations (states) for the Shari'ah except in relation to some of what is referred to as personal situations. But as for economic dealings, political laws and laws pertaining to states, then all of our (Arabic and Islamic) states, without exception, are submissive to the legislation of the West or the East. Likewise the laws pertaining to crimes pertaining to character and prescribed injunctions, they are imported, invented..."
This generalization is not correct, for Saudiyyah, by Allaah's praise, judges by the Shari'ah in relation to its subjects, it establishes the Shariah hudood (prescribed injunctions), and Shariah lawcourts are set up in all parts of the kingdom. It is not infallible, neither it and nor other states. It has reached me that the ruler of Brunei has ordered with judging to the Shariah in all matters and in all circumstances. Hence, it is obligatory to recant from this expression, and to announce this (openly) in the local newspapers in the Kingdom of Saudi Arabia and Kuwait. And if you had expressed (elaborated) more then the subject would have been appropriate due it being the case overwhelmingly. We ask Allaah to grant guidance and success for us and you. Note: You have to bear in mind when reading this that Abd al-Rahman Abd al-Khaliq was the same person who spread the category of Tawhid al-Haakimiyyah as an innovated fourth category of tawhid for which he was very harshly slapped down by the clarifications of the Scholars in which a person speaking with this was described as an ignoramus and an innovator (see here, here, here, here and here). 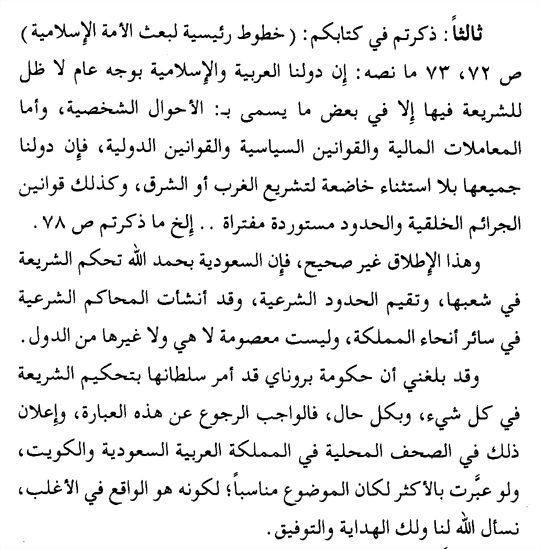 Thus, what we see here in the speech of this Ikhwani innovator is in reality the Haakimiyyah of Sayyid Qutb on account which all governments and states (without exception) are declared disbelievers because they do not judge entirely by the Shariah, and then making the establishment of the rule, top down, to be the greatest goal of the da'wah. This is great deviation from the methodology of the Prophets in da'wah to Allaah and it is the way of Hassan al-Banna, Sayyid Qutb, Abu A'laa Mawdudi, Taqi al-Din al-Nabahani and others. For this reason, you will see in the various books written by Abd al-Rahman Abd al-Khaaliq which are the subject of criticism by Shaykh Ibn Baz and other books he wrote, expressions of the ideas and methodologies of those innovators. The primary target of these people are the Gulf states, and thus whether by revolution (peaceful or otherwise), demonstrations, rallies, open demands for justice and equality (the way of the Marxists, Socialists, Freemasons) party politics, entry into democracy, coups or in some cases, taking gradual, incremental control by infiltrating educational and other government institutions, they aim to seek power through whatever means is appropriate in whatever nation they are operating in and where the climate is suitable for that particular method.